THE VALUE of Scotch whisky exports rose for the first time since 2013 in the third quarter of 2016, as the weakness of the Pound after the Brexit referendum saw exports to the European Union and North America surge, writes Leon Kuebler for WhiskyInvestDirect. In the months of July, August and September, a total of 92.5m Litres of Pure Alcohol (LPA) were exported across the globe, rising by 1.7% from the same period in 2015 and extending this year's solid growth. Year-on-year by value, however, Q3 Scotch exports rose more than twice as fast, up by 4.0% to reach £1,059m. 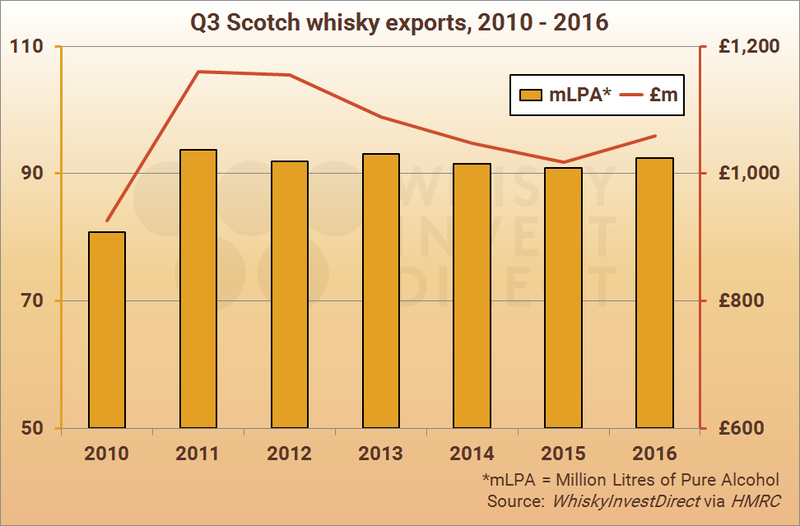 Altogether, 2016 Q3 saw the highest third-quarter export figures for Scotch since 2013, when 93.1m LPA, worth a total of £1,089m, were dispatched worldwide. These numbers are a further indication that the decline in Scotch whisky exports, which began in 2013, may be ending. The volume of Scotch whisky exported has been steadily improving throughout 2016. As reported first here on WhiskyInvestDirect, each quarter has delivered year-on-year improvements over 2015. In Q1, the amount of LPA exported rose by 2.5%, and also increase by 2.6% in Q2, which gave an improvement of 2.6% in H1 overall. Subsequent adjustments to these figures by HMRC show that 2016's Q2 shipments were actually up 3.7% compared to Q2 2015, which meant that there was, in fact, a year-on-year rise of 3.2% in LPA terms in the first half of this year. But the first half of 2016 did not see the value of Scotch exports rise in line with the increased volume of shipments. 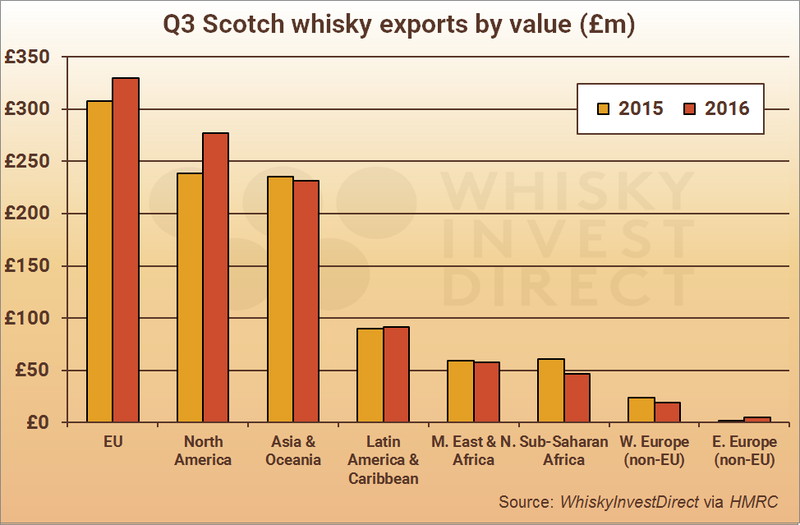 Indeed, 2016 Q3 is the first quarter to show year-on-year growth in the value of Scotch exports since Q2 of 2013. The dramatic improvement in the value of Scotch exports in Q3 is most likely due to the current weakness of the Pound, which fell sharply after the June 23 vote to leave the European Union. As previous research here suggested, the relative strength of Sterling over the last few years, which has made products made in the United Kingdom more expensive overseas, has had an adverse impact on the value of Scotch exports. According to the Sterling Broad Exchange Rate Index (ERI), a measure published by the Bank of England to gauge the strength of the Pound against a range of foreign currencies, the value of Sterling fell by 8% between the second and third quarter of 2016. To put the Pound's current strength in context, there have only been four quarters in the last two decades when Sterling has been weaker than in 2016 Q3, and only once in this millennium (Q1 2009). There is no guarantee that Sterling will remain at this level, and the long-term impact of Brexit on trade deals is still unknown. Yet the results delivered in Q3 suggest that a weak Pound should prove a boon to Scotch exports. The year-on-year increase in the value of Q3 Scotch exports in was mainly due to two regions: the European Union and North America. Shipments to the European Union rose by 7.3% in value and 9.3% in volume; the same figures for North America were 16.2% and 8.0% respectively. Single malt continued to perform well, with Q3 sales up by 16.1% in value and 8.5% in volume on 2015. Exports of bottled blended Scotch remained constant, dropping by 0.5% in value, but rising by 1.3% in volume. Q3 is traditionally the second-most important quarter for Scotch whisky exports, as it begins the build-up to the festive period in Q4. Since 2010, Q3 has averaged 27% of the annual value and volume figures for Scotch. In total, the first nine months of 2016 have seen 242m LPA of Scotch exported at a sum value of £2,766m. These figures are higher than those posted at the same point in 2015 (236m LPA, £2,732m).